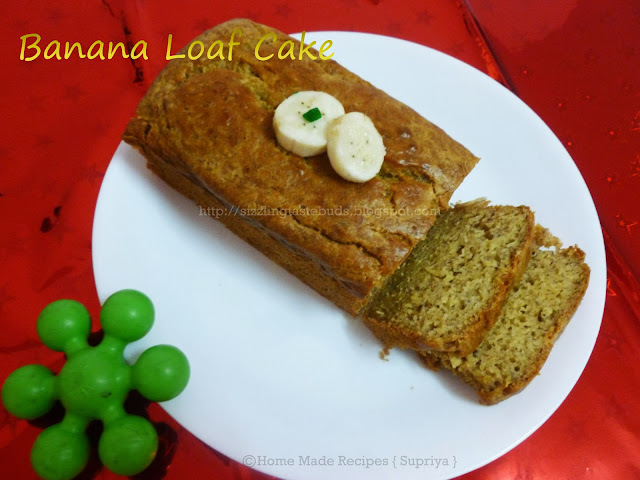 Starting the year 2014 with a Fruit Bake - Banana Loaf Cake. The cake turned out to be light and fluffy. Makes a perfect dish for a breakfast or even as a snack for a tea time. They are healthy too considering the fruits in them. 1. Sift Maida, baking powder, soda, salt, cinnamon powder in a mixing bowl and keep aside. 2. Take another bowl and beat eggs. Add vanilla essence, honey, butter and milk to this and mix till everything combines. 3. Add mashed bananas to this and mix well. 4. Add sifted dry ingredients to the egg mixture little by little and mix well. 5. Grease the cake tin or a muffin tray and pour the cake mixture into it. 6. Bake the cake in a pre-heated (180 C) oven for appx 30 mins or till the inserted toothpick or knife comes out clean. 7. Once done remove it from the oven and place it on a wire rack to cool. Cut it and enjoy. Bananas always goes well with Bread and cakes. This cake seems super tasty and delicious. Loaf cake came out very well.